It’s the end of another year and we’ve been reminiscing about special releases of new fountain pens and fountain pen inks over the past few years. 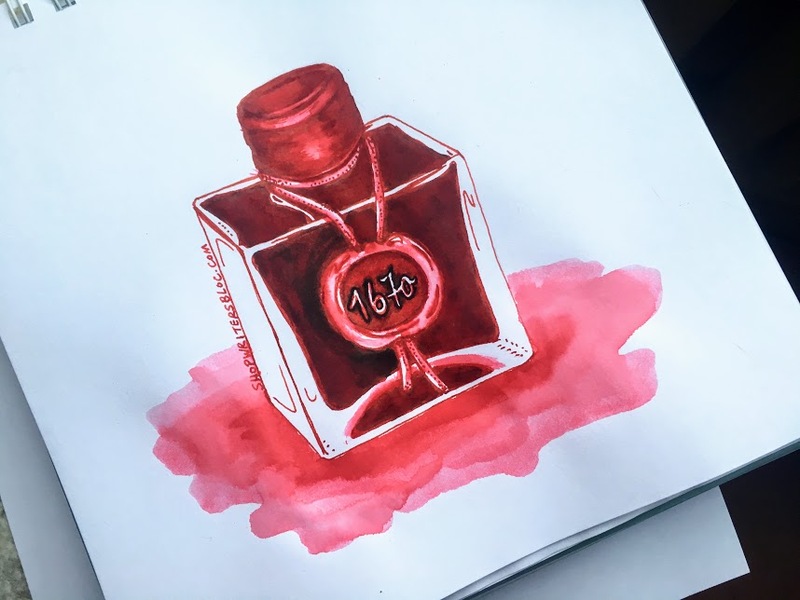 Back in 2010, when J. Herbin released their first 1670 Anniversary Ink in the red Rouge Hematite color, we had no idea there would be more to come. In addition to the original 1670 Anniversary red ink, J. Herbin has created Caroube de Chypre, Emerald of Chivor, Bleu Ocean, and Stormy Grey. 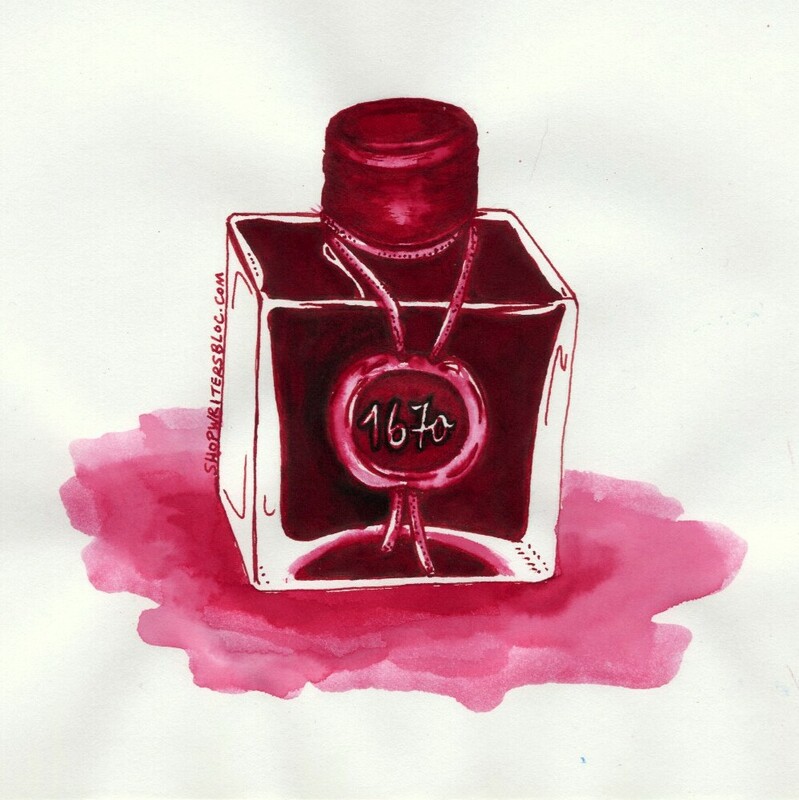 The J. Herbin Rouge Hematite 1670 Anniversary Ink is a vibrant, earthy, rich blood red color, reminiscent of the historic color of the J. Herbin logo and the red sealing wax used by royal courts. Using the right combination of paper and nib, you might even see a gold colored sheen in this ink. We’ve created a homage to Rouge Hematite using that very ink. The drawing is on Clairefontaine 90g sketch paper and was made by using a Pelikano fountain pen with a left-handed nib, a dollar store paint brush and a Pentel Tradio Stylo Pen. What would you like the next color of J. Herbin 1670 Anniversary Ink to be? Back to school for students who love stationery is an exciting time that means backpacks full of shiny, fresh school supplies with that brand-new stationery smell! Here are some of our favorite supplies for your stationery fix in the new school year. 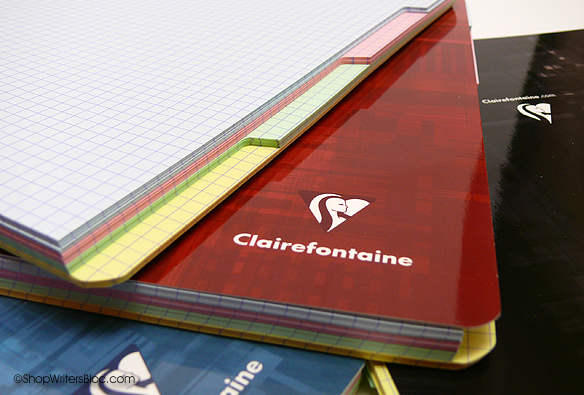 Clairefontaine notebooks rock some of the best paper in the world for writing! This paper has a super smooth coating on it that reduces writing fatigue by allowing your pen to easily glide across the page. The quality of the paper minimizes any instances of ink bleeding through or showing through the paper which allows you to write on both sides of each page. Clairefontaine notebooks are especially awesome if you like to write with a fountain pen. There’s a huge variety of notebook styles and sizes from Clairefontaine, we’ll mention a few of our favorites here and you can check out the rest yourself. Clairefontaine Wirebound Notebook – Large, Ruled w/Margin. 8.5″ x 11″ size and each page is 3-hole punched to fit American 3-ring binders if you decide to remove the paper from the notebook. 90 sheets per notebook. Clairefontaine Classic Wirebound Notebook – A4 Large Size, Ruled. Includes a generous 96 sheets and you choose the cover color: Blue-Gray, Red, Blue, or Black. 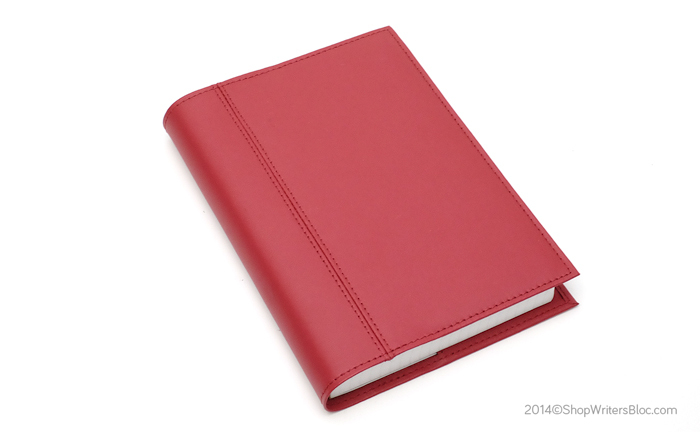 Clairefontaine Classic Staple Bound Notebook – Large, Ruled w/Margin. Great paper for an economical price! 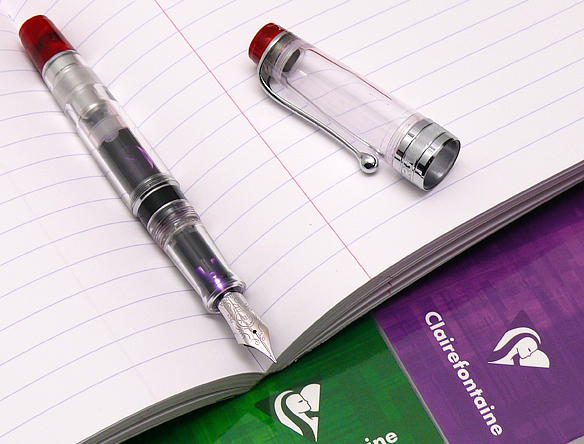 A fountain pen is the perfect companion to go along with your Clairefontaine notebooks. Fountain pens help with writing fatigue by reducing the friction required to write and Clairefontaine paper has a satin smooth surface to reduce the fatigue even more. If you’re going to spend a lot of time writing you may as well enjoy it! For school or college purposes we would recommend a pen that’s not too expensive that can be filled with washable blue ink cartridges (more info on that in a moment). When you’re on the go, ink cartridges are easier to use than bottled ink and both the LAMY Safari and Pelikan Pelikano have washable blue ink cartridges with a decent ink capacity: LAMY Blue ink cartridges or Pelikan Royal Blue giant ink cartridges. 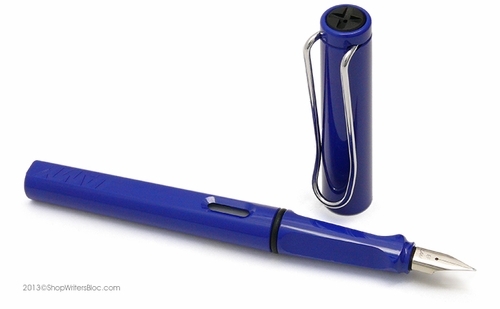 The Super Pirat Ink Eradicator can erase mistakes made when writing with royal blue fountain pen inks and then you use the blue correction tip to correct the mistake. This correction pen is a fantastic addition to your fountain pen and Clairefontaine paper. If you’re wondering how it works take a look at this blog post: What is the Pelikan Super Pirat Ink Eradicator? Academic planners are special because their dates correspond to the school year instead of the calendar year. They begin with the month of July or August and end with the month of July in the following year. Quo Vadis offers a variety of high quality planners and covers to keep even the busiest students organized. Clairefontaine Multiple Subject Notebooks get their own mention because they accomplish more than one purpose. In addition to tabbed, different colors of paper to keep your notes on different subjects organized, they also help save on space and weight to minimize the number of supplies you need to carry with you. These multiple subject notebooks have paper with a 5mm x 5mm grid so if you happen to have small handwriting you can get a lot of notes on one page. Clairefontaine Multiple Subject Notebooks are available in small, medium and large sizes. If you’re not into fountain pens, check out the space saving, smooth writing Uni-ball Jetstream 3 Multicolor Ballpoint Pen. It conveniently gives you 3 choices of ink color in one pen body. The pen comes with blue, black and red ink ink cartridges with a 0.7mm tip but can be refilled with any colors you wish. 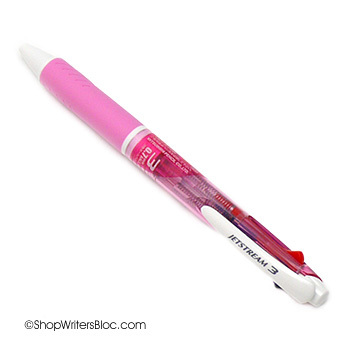 The pen is available with your choice of a pink, light blue, lime green, black or transparent body. 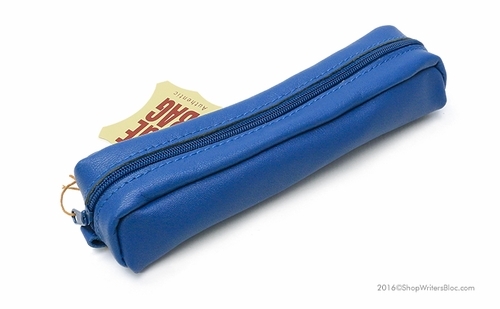 Carry your writing instruments in style with a leather zippered pen and pencil pouch from Aston Leather or Clairefontaine. Both cases are reasonably priced and durable enough to last for years. What are your favorite new school supplies to buy at the beginning of the school year? Do I need a left-handed nib on my fountain pen if I’m a left-handed writer? I am a left-handed writer and the first time I used a fountain pen I had no idea left-handed fountain pen nibs even existed. It didn’t occur to me that there would be any problem using just a regular nib and I didn’t notice any problems. Years later, I’m back to using fountain pens regularly and have discovered that there are a few nibs out there specially designed for lefties. Many ask the question: Is it really necessary to have one of these special nibs if you are left-handed? Left-handed fountain pen nibs are generally more rounded on the tip with the idea of producing a smoother writing experience. This particularly applies to languages such as English that are written from left to right. 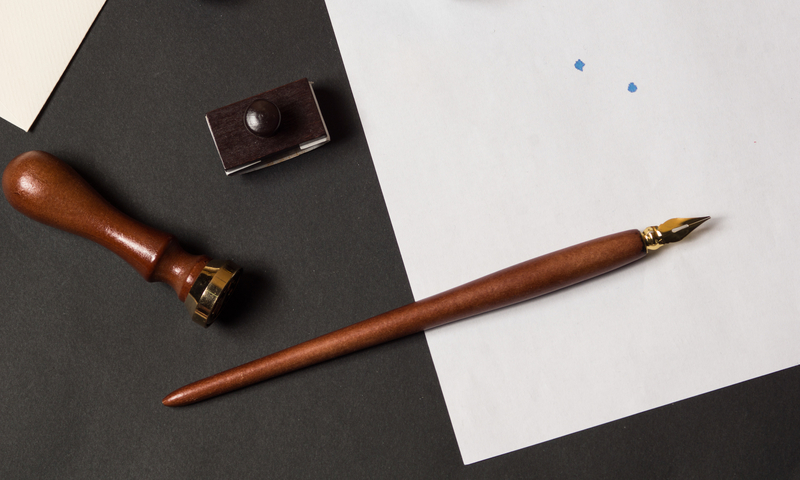 When left-handed people such as myself write, the pen is often angled in such a way that the pointiest part of the pen, the nib, is being pushed along paper made of fibers that are not impervious to tearing and which offer some resistance. It’s like taking a sharp nail or a pin and pushing it along a piece of paper at a 45 degree angle with the pointy end facing the direction it is being pushed. Likely you’re going to end up piercing that piece of paper with your pin! In contrast, try taking that same pin and pulling it along that same piece of paper with the pointy end facing away from the direction it is being pulled. It feels smoother as you pull it and it is much less likely that you will pierce the paper. That would be more like the experience of a right-handed writer. So as you can see, pen nibs of all kinds have a huge influence on whether or not a lefty has a good or a bad writing experience. I personally find that a good writing experience for a lefty does not stop at the kind of nib on the pen. It is extremely important to me that whatever ink I’m using dries quickly or else I’ll smear it all over the place. The type of paper I use is also important since this affects the drying time of the ink. In addition, if paper is of very poor quality or tears easily, I may find myself poking holes in the paper with my pen or pencil. Each writer needs to experiment with different combinations of pen, ink and paper before discovering what works best for them. I own many fountain pens with a variety of nibs, and three of them happen to have left-handed nibs. I personally find that the left-handed fountain pen nibs aren’t necessarily any better or any worse than using a regular fountain pen nib. I’m not sure if you will have the same experience. I must say though, that I can’t go wrong with my left-handed Pelikano Junior fountain pen. I don’t always want to write with such a broad nib, but I appreciate its smoothness when I use it. For the left-handed writer that is new to fountain pens, I would suggest starting out with a nib that is middle-of-the-road, perhaps something like a LAMY Safari with a left-handed, fine or medium nib. You might find extra-fine nibs to be too sharp and “pokey” at first, and broad nibs may lay down so much ink that you are smearing your writing too much. Another pen that I felt was easy to write with from the first time I picked it up is the Platinum Preppy with a fine nib, or for a nicer version of this pen with the same nib, the Platinum Plaisir fountain pen. If you get a chance to purchase a fountain pen with a left-handed nib, it is worth giving it a try. 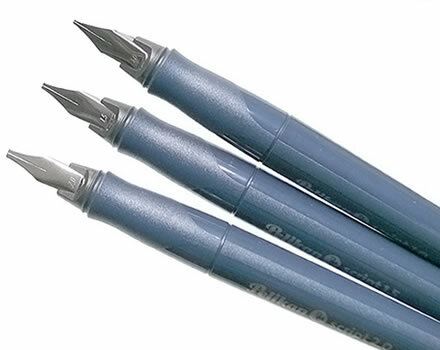 The Pelikan Pelikano and Pelikano Junior are both readily available with left-handed nibs. 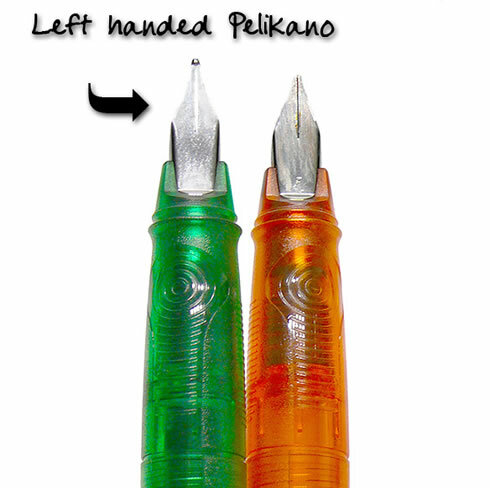 The Pelikan Pelikanos also have a grip that is modified to fit a left-handed writer. I’ve also heard of some lefties sending in their expensive nibs to be customized by a nibmeister, but I’ve never felt the need to do this myself. Are you a left-handed writer? What kind of pen or fountain pen do you like to write with? Do you own any fountain pens with left-handed nibs? We were recently contacted by a schoolteacher who wanted to introduce her students to the “lost art” of calligraphy and writing with a fountain pen. She was looking for supplies that were both affordable and capable of withstanding the wear and tear of her students. 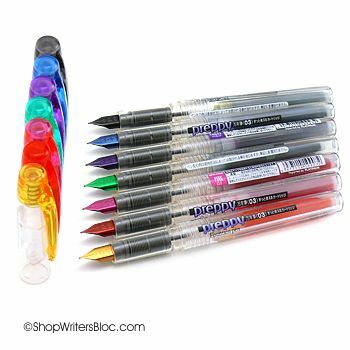 Fortunately, Writer’s Bloc carries a wide selection of calligraphy supplies and fountain pens that are tailored to the needs of students. Our hope is that introducing students to calligraphy and fountain pens will bring about a newfound appreciation for writing. Here are some ideas for teachers and students who want to try their hand at calligraphy and using fountain pens. The Platinum Preppy Fountain Pen is a good choice for a first fountain pen. This fountain pen is of good quality for its price and is a great way to supply the classroom with affordable quality fountain pens. Students will be able to choose from an array of colors and find one that suits them best. The Pelikano Junior Fountain Pen is great for our aspiring little writers since this pen is specially designed for children. 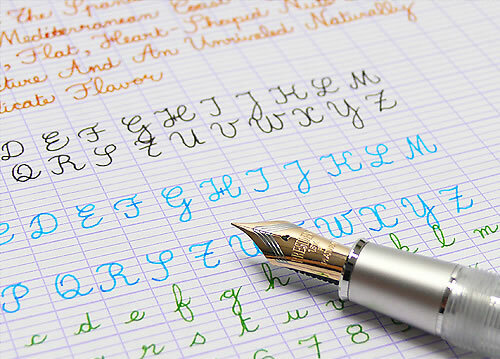 The Pelikano Junior Fountain Pen is available in four different colors and is also available with a left-handed nib for all the left-handed writers. 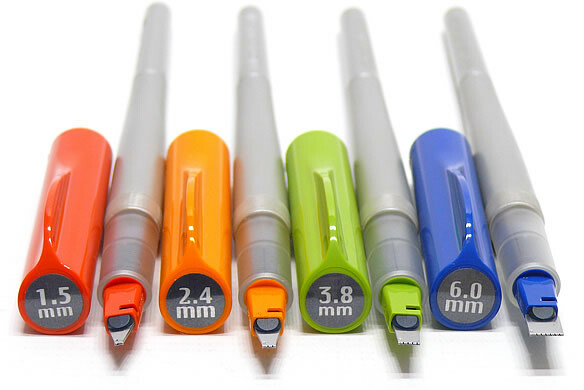 For older students, the LAMY Safari is a popular choice. 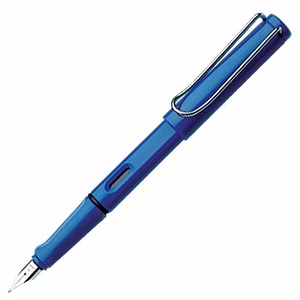 This fountain pen is a favorite daily writer of both teachers and students around the world. The LAMY Safari fountain pen comes in several colors and different nib sizes including 1.1mm, 1.5mm and 1.9mm calligraphy nibs. For those new to calligraphy the Pelikan Script Calligraphy Pen is a nice starter pen. UPDATE: The Pelikan Script has been discontinued. 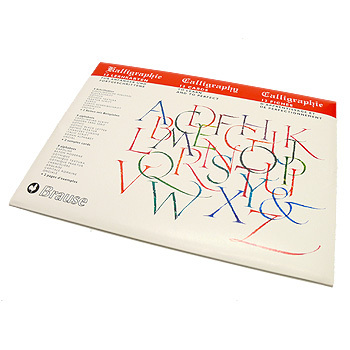 The Introduction to Calligraphy Lettering Cards from Brause are a useful guide for practicing Calligraphy. Introduce your students to nine different lettering styles and let them teach each other! Many teachers and students in the USA are unfamiliar with the French ruled paper commonly used by students in France and other countries. This paper is an excellent tool for anyone who wants to learn cursive writing, to improve their handwriting or to practice calligraphy. For more information about French rule paper you may wish read one of our previous blog posts: What is French Ruled Paper? Do you love writing as much as we do? What tools do you personally find useful to help students and others to develop the art of calligraphy and handwriting? I was rather excited to get my hands on another fountain pen specifically designed for left-handed writers – the Pelikan Pelikano Junior with an “L” nib. It is an amazingly smooth writer for such an inexpensive fountain pen! This pen is designed with beginning fountain pen users in mind and is actually a children’s school fountain pen. The nib is rounded in shape so it is not “pokey” (especially important for us lefties) and it is very forgiving. I can even write a fine line with it when the nib is upside-down! 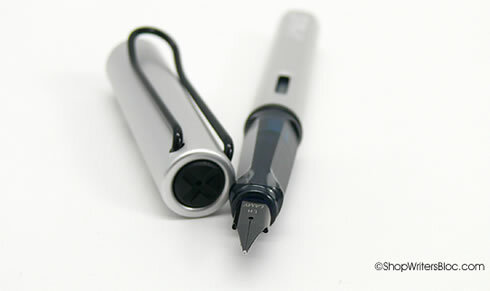 The nib is a Pelikan “L” size for left-handed writers, or an “A” size on the version of the Pelikano Jr. for right-handed writers. It makes a medium-broad size line and has a very wet ink flow. In fact, if you carry this pen with you, you’d better have an extra ink cartridge on hand for when your ink runs out (Pelikan 4001 giant ink cartridges are a good choice). Some people might not appreciate this small inconvenience, but I like changing ink colors frequently so this is one thing about the Pelikano Jr. that I really like. Since this pen lays down a lot of ink, for a lefty I would suggest using an ink with a decent drying time to help prevent any smudges. Because it produces a bold line, this is also a good pen for those of us that like to use light or bright fountain pen ink colors. The funky, minimalist and colorful design of the Pelikano Jr. instantly appealed to me. The pen is rather chunky, but not heavy, and provides a good rubber grip designed to assist with finger placement. When you unscrew the pen there is a smooth area to attach a name sticker to (plain stickers are included with the Pelikano Jr.). When the pen is screwed back together you can read your name through the pen barrel, which is helpful to keep well-meaning right-handed friends, students, etc from swiping one of your favorite everyday fountain pens. 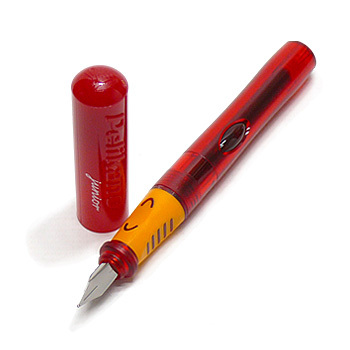 The Pelikano Junior has no clip, and the body is very plain except for a couple of oval shaped bumps to keep the pen from rolling and the cap has the word “Pelikano” on it in raised lettering. I like to write with the cap off of this pen. I would imagine that the rather large size barrel on this pen would be helpful to assist small hands learning penmanship for the first time, as well as for older ones that have a bit of trouble gripping a pen. 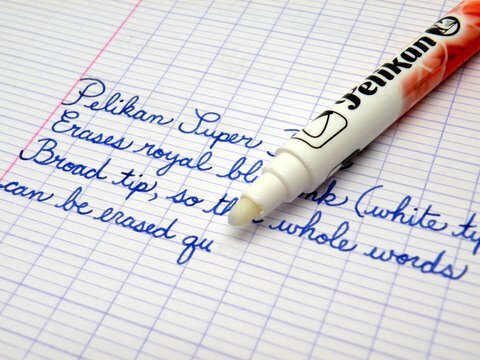 The Pelikano Junior fountain pen is a great pen for everyday use and it has fans that include people of all ages! The bright translucent Pelikano Jr. colors include green (my favorite), blue, red and yellow.